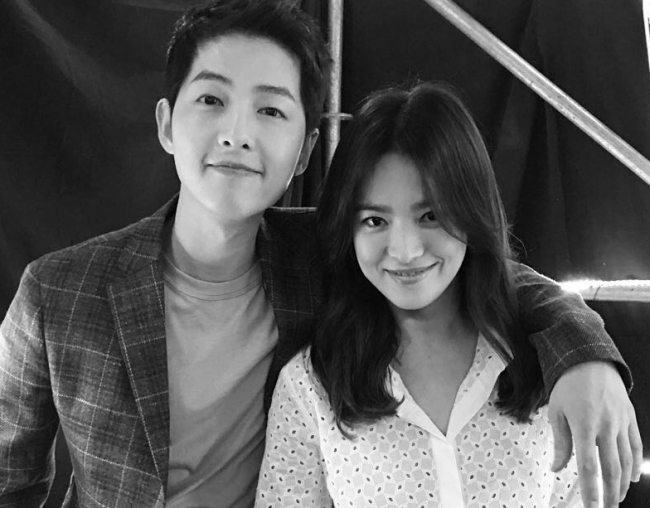 With the internet abuzz over the newly revealed couple of Song Hye-kyo and Song Joong-ki, fans are focusing on other star couples who met on drama sets and ended up tying the knot. The most recent case was the wedding of actors Lee Sang-woo and Kim So-yeon. The couple met while starring in the TV drama “Happy Home” last year and admitted that they are in a romantic relationship a month after it ended. Lee and Kim walked down the aisle on June 9 in a private ceremony in Seoul. Joo Sang-wook and Cha Ye-ryun are another couple who met while working on a drama, MBC’s “Glamorous Temptation,” which aired from 2015 to 2016. The couple also acknowledged their relationship shortly after the show ended and tied the knot in May this year.